All Pro III Series truck racks - ladder racks are constructed with the same Kargo Master industrial quality methods and materials that have set the standard of the industry for over 32 years. Serious tradesmen use substantial tools. Kargo Master Truck Racks - Ladder Racks are the top choices because they work hard and look great! Made tough—made to last. Kargo Master Pro-III Medium-Duty Truck Racks—Ladder Racks will meet and exceed your tough job demands, all while looking great on your truck. What sets Pro-III ladder racks above the rest? Each one is constructed with the KargoMaster industrial-quality materials and methods that have set the professional standard for over thirty years. High-tensile strength steel tubing (1 5/8" diameter, .083" wall) gives strength without excessive weight. Holds up to 1000 pounds, so there is plenty of support for all the ladders you need to move. 5" swaged joints provide additional strength. Four-bolt system allows for easy rack removal. Tall loads? Not a problem with the quick-release rear crossbar. Use the rear-grab loops to access the truck bed easily. All KargoMaster Pro-III Medium-Duty Ladder Racks are coated with the most rust-resistant finish in the industry—zinc epoxy primed beneath a marine-grade powder coat finish or yellow zinc chromate plated. What does this mean for you? It means the finish will not fade or dull. In addition, even our fasteners are yellow zinc plated for added strength and resistance to corrosion. 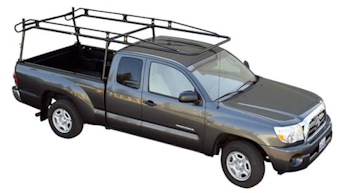 Note that the front bar of all ladder racks overhangs the truck cab—except for extended/crew cab long-bed trucks. Want a longer rack? Check out the Pro-II line of ladder racks from KargoMaster. KargoMaster Pro-III Medium-Duty Ladder Racks are available in gloss black.